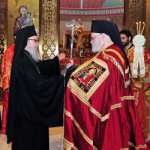 PITTSBURGH, Pa – His Eminence Metropolitan Savas was enthroned yesterday Dec. 8, as Metropolitan of Pittsburgh during a magnificent and traditional ceremony at the St. Nicholas Greek Orthodox Cathedral in Pittsburgh. His Eminence Archbishop Demetrios of America and Exarch of the Ecumenical Patriarchate, presided over the ceremony which was attended by more than 600 faithful of the Metropolis, more than 60 clergymen of the Metropolis and many visitors from across the country. The ceremony began at 4 p.m. with the Procession of altar boys, Priests and Deacons vested in red and the entrance of Hierarchs. Metropolitan Maximos was accompanied by Metropolitan Nicholas of Detroit and entered the Church just before Metropolitan Savas who entered the Cathedral last. When he reached the Solea he vested the mandyas (a long vestment of crimson silk). Archbishop Demetrios handed Metropolitan Savas the pastoral staff (rabdos), signifying his pastoral and disciplinary responsibilities. Shortly after, Metropolitan Savas ascended to the Episcopal Throne from where he presided over the rest of the service. Bishop-elect Sevastianos of Zela read the Patriarchal Proclamation. “You are called to offer love and truth, you are called to offer the presence of God,” said Archbishop Demetrios in his address to the new Metropolitan at the end of the service. He also said that all the years of Metropolitan Savas’ life were leading to this very point in his life, which is a new beginning of bearing spiritual fruits for all the faithful entrusted to his care and for the Glory of God. At the conclusion of Metropolitan Savas’ address, Archbishop Demetrios proclaimed the new Metropolitan “AXIOS!” and the faithful responded with the traditional acclamation of “AXIOS!” (Worthy) and chanted the unique prayer of “Many Years” known as the bishop’s Pheme. Present in the Enthronement were Metropolitan Maximos (formerly of Pittsburgh), Metropolitan Nicholas of Detroit, Bishop Dimitrios of Mokissos, Metropolitan Constantine of the Ukranian Archdiocese of USA (Ecumenical Patriarchate), Bishop Thomas of the Antiochian Archdiocese, Bishop-elect Sevastianos of Zela, the Chancellor of the Carpatho-Russian Diocese Very Reverend Frank Miloro, and ecumenical leaders Archbishop Robert Duncan of the Anglican Church in USA and Bishop Kurt Kusserowe of the Evangelican Lutheran Diocese of Pittsburgh and other ecumenical and civic representatives. A reception for all the faithful and later a banquet, hosted by the Metropolis of Pittsburgh and the Cathedral of St. Nicholas, followed in the great hall of the community center. Today, Dec. 9, 2011, His Eminence Metropolitan Savas, assisted by the Clergy of his Metropolis, presided over the Divine Liturgy, for the first time as Metropolitan of Pittsburgh. A photo gallery is available at http://photos.goarch.org/main.php?g2_itemId=5053.